You probably read the title of this post and thought, “Wait! I thought Snapchat was only used for personal pleasure and enjoyment?” While you might be 85% correct, there are some great ways you can use Snapchat to market your business. Mobile and text message marketing are all the rage right now. Considering 4 out of every 5 millennials own and frequently use a smartphone, if your business isn’t taking advantage of these marketing tactics, you’re missing out. But, we will admit, it takes an above average marketing brain to figure out how to use Snapchat for business. With that said, we did some research, and would like to explain this new strategy to you in the simplest way possible. With a bit of creativity, and some guidance from the marketing gurus here at Slicktext, you too can experience great results by using Snapchat for your business. 1. Talk in the language of your recipient. 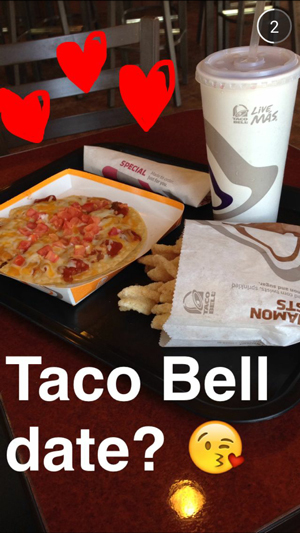 Taco Bell is a great example of a company who uses Snapchat the right way. In this snap, they obviously want to feature new product, but not once do they say “HEY! LOOK AT ALL THIS AWESOME FOOD WE SELL!” They keep it personal and informal, which ultimately leads to a loyal fan base and an increase in long term sales. 2. Send a photo series that tells a story. Why stop at one photo? Send a series of 3-5 photos that tell the story. Put your followers on the edge of their seat. This tactic is especially useful for new product launches. Spread your story out over a period of a few hours, but we wouldn’t recommend any longer. People get bored and forget what you snapped after a while (it doesn’t help that the image disappears almost instantly). 3. Stay away from spammy, promo type messages. They might work once , or maybe even twice, but if all you do is send snaps with “20% OFF TODAY ONLY” sprayed across the photo, eventually your followers will get tired of receiving these messages and stop engaging with your brand. 4. Keep it as personal as possible, but don’t cross the NSFW borderline. If you use Snapchat, you probably know that most of the images sent out are NSFW. Get personal with your followers, feel free to even snap a small group of VIP’s, but never send personal after hours snaps with your company account. There’s a difference between building a brand and just building a bad reputation. 5. Examine open rates by running split tests with your followers. Since your snap is not seen until opened, you’ll never be able to run a content based split test. But, you can run a test that focuses on time of day. For example, send the same message to all followers, but send one in the morning and one at night. This will help you better understand your followers and when is the best time to send them snaps.